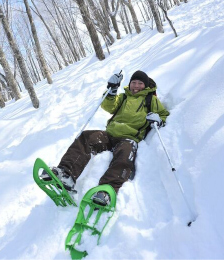 Hakuba Sanroku Tours is a specialized land operator in Hakuba Valley that arranges excursions to fantastic places in both Nagano and neighbouring Niigata Prefectures. With over 50 years' worth of experience and happy customers, no one comes close to Hakuba Sanroku Tours for perfecting your holiday experience in the popular Hakuba Valley. 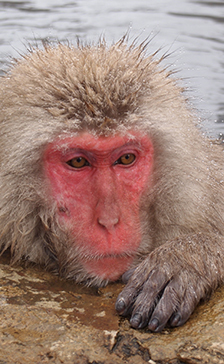 You may have a unique experience to watch the Macaque up close and observe them bathing in hot springs at the Snow Monkey Park. 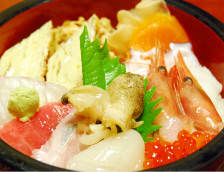 After visiting the park enjoy a Japanese Kaiseki lunch at the small but dynamic town of Obuse. You will then have the chance to visit one of the most visited temples in Japan, Zenkoji Temple. * Please wear warm clothes and water proof shoes. If you enjoy Japanese food and are interested in learning the art of Japanese cooking or in eating true Japanese cuisine, this is the opportunity for you! The cooking expert will teach you how to make Gyoza and traditional hand-rolled sushi. 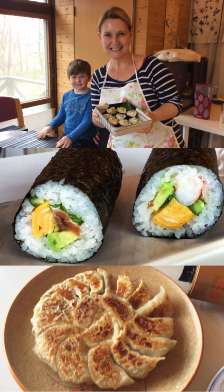 You may enjoy your very own Gyoza and Sushi creations for lunch. Don’t miss the chance to make a cooking class from a professional! * Minimum 2 guests required to run the tour. * Maximum size per group is 6 guests. Learn the art of making real Japanese tea and enjoy it with a group of friends in a very cultural Japanese tea ceremony style. 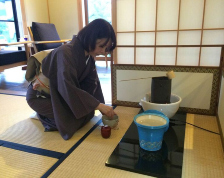 With a local guide using local tea you are sure to enjoy everything Nagano has to offer. Beautiful, authentic Japanese modern style Café, you will sit on traditional tatami floors and feel every bit of Japan. Take a nice wander through the trees and explore the silence of Hakuba's more removed areas on snowshoes. On fresh untouched snow, find yourself lost in a snow wonderland. A new relaxing way to enjoy the winter, a new snow sport away from skiing and snowboarding. Exact meet up place will be advised at the time of booking. No Japan holiday is complete without trying a fresh sashimi or seafood meal. Itoigawa city is just 1 hour away from Hakuba Valley by bus. First you will have the chance to visit an Art Museum with silk road theme to get an insight into wooden Buddha sculpture and beautifully designed Japanese gardens. Get ready to experience this gourmet tour like never before! Price: 12,000 yen / person (ages 6 and above). Minimum of 2 guests are required to run the tour. Itoigawa is 1 hour away from Hakuba. Matsumoto Castle is one of four castles designated as “National Treasures of Japan”. You will be surprised not only by Matsumoto Castle, but also transforming to Samurai and join the authentic course which allows you to experience the Samurai Spirit through performing “Kembu”. Learn basic techniques such as handling a Japanese sword, performing slashing techniques and some simple samurai actions. Price: 105,000 yen for 2 people, add 4,500 yen per person. Tour can be arranged depending on your schedule. Matsumoto is 1.5 hours away from Hakuba. You can experience professional kimono dressing at an Edo period’s building. 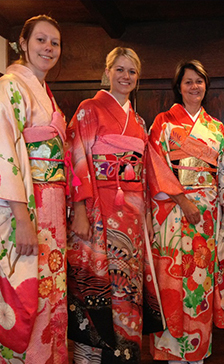 Lots of colorful and elegant kimono outfits are available to choose from. Our professional kimono teacher will make the ribbon knots with her own hands during the activity, letting you experience real Japanese kimono dressing! Minimum of 2 guests required to run the tour. Children must be at least 150cm tall. 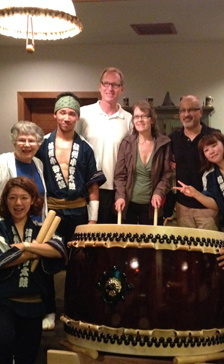 Taiko drumming is an indigenous part of Japanese culture dating back more than 1400 years. You not only have chance to experience the awe-inspiring sound of local taiko drumming performed by a local professional team, but also play the Taiko drum together with them. Let’s enjoy making music and receiving a good physical workout at the same time!